Throat halyard, topsail halyard, sweating the line, baggywrinkle, staysail club lift. 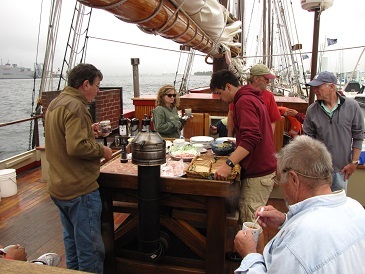 When we signed up to crew on the Mystic Whaler for the 25th Great Chesapeake Bay Schooner Race, October 15-19, 2014, we didn’t expect to have to learn so quite so many new sailing terms. But a 110-foot sparred length schooner has a bit more rigging than our 24-foot sailboat. A few of the 34-boat fleet at the start, with Mystic Seaport’s Brilliant (#22) closest to the camera. What started as a spur of the moment decision turned into five days of new sailing knowledge, racing with an interesting group of co-adventurers, and wonderful, lasting memories. It’s definitely a Bucket List item. We arrived at the boat on Tuesday afternoon, October 14, 2014 to deposit our gear and to go out and explore around the Baltimore Marine Center at Lighthouse Point where several other schooners were docked, including the Pride of Baltimore II. Although the Mystic Whaler usually sails out of New London, CT, she relocates to Baltimore, MD for a couple months in the fall. After a great dinner at Bo Brooks Restaurant, we returned to the Mystic Whaler to meet Captain John Eginton, “Admiral” Pat Beck – the first mate, and the rest of the regular and irregular crew. After getting settled in our cabin, we went up on deck to get acquainted with everyone. Besides the regular crew of six, there were two additional licensed captains to serve as watch captains during the race and about 15 others who had signed on for the race as we did. We were a varied group, with a wide range of sailing experience, coming from as far away as Texas. The safety orientation made everyone aware of all of the equipment on board. Unfortunately, Wednesday dawned cloudy and rainy. The Mystic Whaler was participating in the educational program for the morning, so we had five or six groups of middle school students from Baltimore area schools coming by to learn about schooners. They had a hands-on activity to learn about buoyancy, hoisted a sail while singing a sea chantey, and learned about navigation. Later that afternoon, the Mystic Whaler crew divided into our watch groups for race day planning and some team-building activities. Because of the bad weather, the parade of sail around the Inner Harbor of Baltimore was cancelled. The welcoming party at Bo Brooks Restaurant featured an array of delicious food provided by a variety of area restaurants. All of the food served while we were on the Mystic Whaler was delicious, with a variety of hearty homemade soups and desserts as well as muffins, baked chicken, pasta, salads, and fantastic breads. The different watches took turns setting out and cleaning up the meals. Thursday morning, we headed out for the starting area with very light wind, about three knots. We sailed past Fort McHenry and the special star-spangled buoy marking the location where Francis Scott Key was moored on the sloop, President, when he was inspired to write ‘The Star Spangled Banner.’ As we approached the starting area, it was quite spectacular to see 34 schooners of all different sizes under full sail and maneuvering for position. 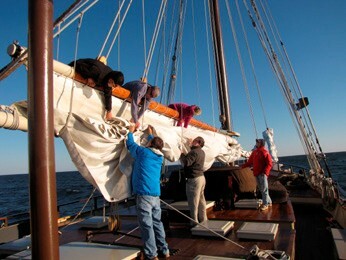 Everyone pitches in when it’s time to hoist or lower the sails. 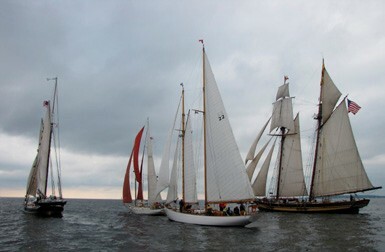 The race started at 1330, and it was interesting to see how the different schooners positioned themselves in the bay. Some schooners chose to sail closer to the shipping channel than others. The commercial traffic on Chesapeake Bay is quite a bit different from Long Island Sound, with oil supertankers, container ships, and other very large vessels requiring room to maneuver. 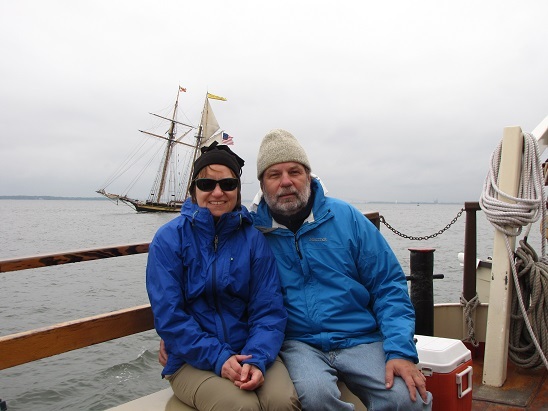 We were fortunate to have Jeff Holland on board, a longtime resident of the Chesapeake Bay area with a wealth of knowledge about the history and ecology of the Bay. He also entertained us by singing sailing songs accompanied by his ukulele. Another renowned crewmember, Jay Irwin, author of Tale of the Green Dragon, won the Great Chesapeake Bay Schooner Race 2014 Black Dog Award for “loyalty to the race mission and faithful and honorable support for the event without personal recognition.” It was a great treat to have the chance to crew with Jeff and Jay. Their very unique and colorful insights added greatly to the whole race experience. There were five watches scheduled on a rotating basis so everyone would stand watch at a different time over the course of the race: 1200-1800, 1800-2200, 2200-0200, 0200-0600, and 0600-1200. Our first watch was 0200-0600. As we were waking up and getting dressed to go up on deck, the wind came up noticeably. It went from about 1.5 knots to about 7 or 8. The group coming off watch had had a very frustrating time drifting along in the dark. About an hour after we came on watch, our watch captain was contacted by an oil tanker that had seen us on the AIS to notify us they would be passing us in about 20 minutes. We all kept a sharp eye out for them. As they approached, they were a confusing mix of a very dark mass in front of a brightly lit superstructure. As they passed us, they blocked out a large extent of lights on the opposite shore. It was interesting to see how observing the absence of light could be just as important to sailing safely at night. In general, there was a lot of chatter between the schooner fleet and the commercial traffic because of the light winds and the limited maneuverability of the schooners in these conditions. We raced until about 1600 on Friday. Even though the wind had come up, Captain John decided to abandon the “Great Schooner Drift” because there still wasn’t enough wind for us to get to Portsmouth, Virginia in time for the Saturday morning activities. The Mystic Whaler would once again be hosting school groups, this time from the Norfolk/ Portsmouth area. We were scheduled for the 0600-1200 watch on Saturday, but because we were no longer under sail we didn’t have to be up on deck. We decided to keep to the schedule anyhow, and were treated to an amazing feat of docking in Portsmouth harbor by our captain. He had to maneuver through a narrow inlet, past a docked harbor ferry, into a circular area where four or five other schooners were already docked. As he called out commands to dockhands and deckhands, expertly spun the helm, and backed the Mystic Whaler into her just-big-enough dock space, we just watched in awe. It was definitely worth getting up at 0600, even though we didn’t have to. Although we had missed the Friday night party, there was another one Saturday afternoon with a pig roast and other picnic-type food, followed by the awards ceremony. We had some free time Saturday afternoon, so we visited the Portsmouth Naval Shipyard Museum, the Lightship Portsmouth Museum, and walked around the harbor taking pictures of all of the schooners. On Saturday night there were various parties on the different schooners, with one having so many partiers on board we wondered if it was going to sink. On Sunday, we packed our gear and said our good-byes. A group of us needed to get to the Norfolk airport, so we all piled into a taxi with all of our gear. As we said our final good-byes at the airport, we all agreed it was a fantastic sailing experience with a fun group of sailors. Carol and Bob Kubis are active members of Housatonic Boat Club in Stratford, CT, where they race their J/24 Loose Cannon.